If it seems like things are super quiet around here, it’s because “real life” has been nuts. Back in July I returned to college (mix of programming, web development, and research). I also started doing CrossFit and there’s been a ton of housework to do. Ah! It’s also just been incredibly hot this summer, so all my free time has been dedicated to getting as much water time as possible. However, when my first semester back wrapped up last Friday and I found myself with a day off with reasonable weather – we just had to go hiking (plus I had a new Osprey backpack that needed some trail love). I didn’t have really any clue where to go, but I knew I wanted to walk far enough into the woods that I wouldn’t be able to hear civilization so a quiet trail into a wilderness area was the ideal option. After scouring our AMC maps and some fantastic online resources, we finally decided on Greeley Ponds off the Kancamangus Highway. What made this hike awesome? It was easy. Of the few people we did see on this hike, you could tell it was just about for anyone who didn’t mind a little bit of walking and hiking (seriously, big kudos to the lady hiking with a blind dog). 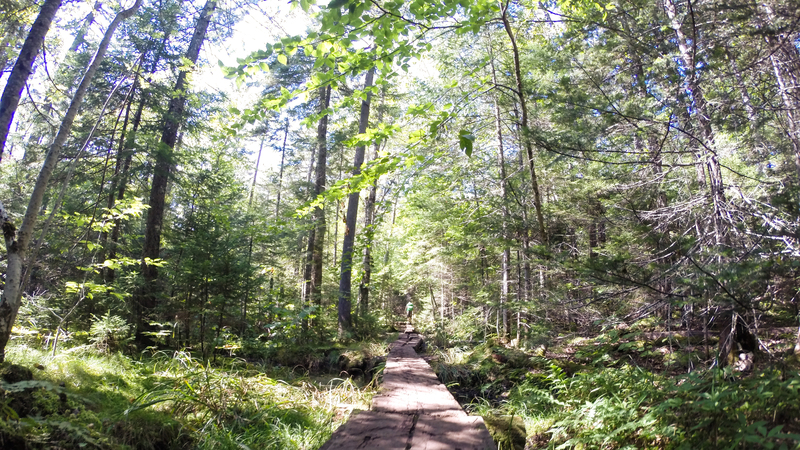 The trails are pretty flat, but the obstacles on them – such as the never ending log bridges – made them pretty fun. It was beautiful. I’m a fan of hikes that have pretty trails and even better end points, so Greeley Ponds was lovely. The trails went right through the woods, over brooks and streams, and deep into the forests. It was quiet. The parking lot for Greeley Ponds is tiny, so I have a feeling this trail can never really get too busy, but the quiet nature was made even better by a total lack of cell reception (I needed that type of quiet). So, are you in need of some peace and quiet? Here’s the details on the Greeley Ponds hike. Where: Start the Greeley Ponds trailhead on the Kancamangus Highway (Route 112). If you’re coming from Lincoln, it’s a tiny little parking lot on your righthand side shortly before the infamous hairpin turn you all know too well if you’ve driven the Kanc. Obviously if you’re coming from Conway, it’s right after the hairpin. 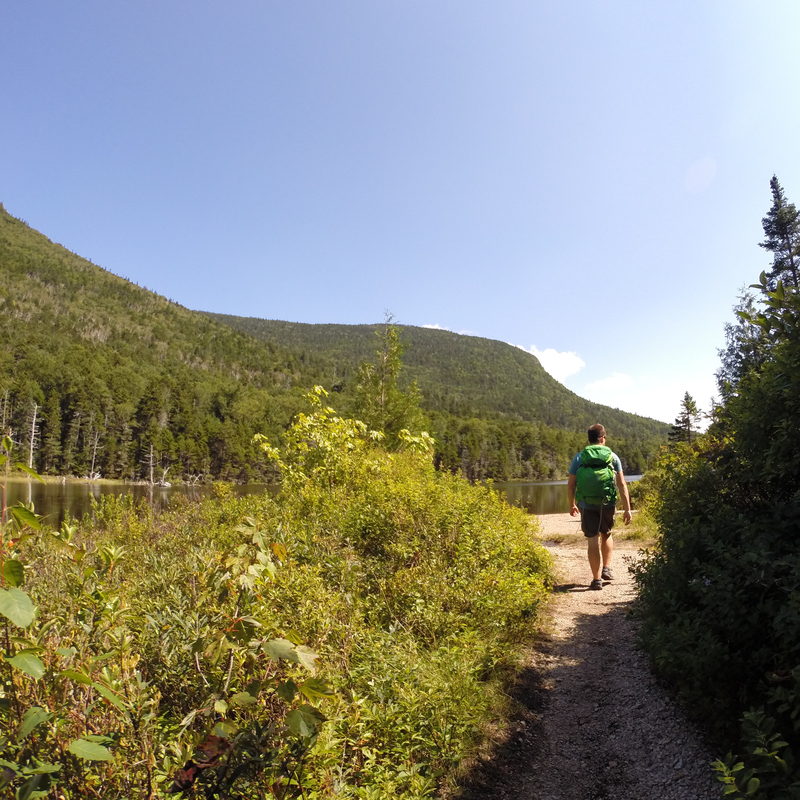 For more information on the hike, check out this fantastic write up on Hike New England. How Long: To the lower pond and back, it’s just around 4.4 miles. We did the entire hike (with lunch break) in less than three hours, but we were having fun going fast. Most folks can probably expect to do this hike in about 3-4 hours. What to Bring: As always, hiking in the White Mountains can bring all sorts of dangers including getting lost, wildlife encounters, and injuries so don’t let the short distance fool you. Always bring food, water, maps, a compass, and a first aid kit! Also, this area is within WMNF so you do need a parking permit which you can either purchase there (bring cash) or get a pass at the Lincoln welcome center or Saco (Conway) Ranger Station.